Kolkata: It rarely happens that someone who himself is a teenaged student takes up the responsibility of nurturing other children. But teenager Wali Rahmani, who has made waves with his YouTube videos is doing some significant work for the society, which is rarity. The 19-year-old law student has adopted 23 orphans with the intention of nurturing them as future leaders. He founded Umeed, an organisation which works for the better future of orphan kids and takes care of their overall development. On April 1, Umeed turned one and celebrated its first foundation day. 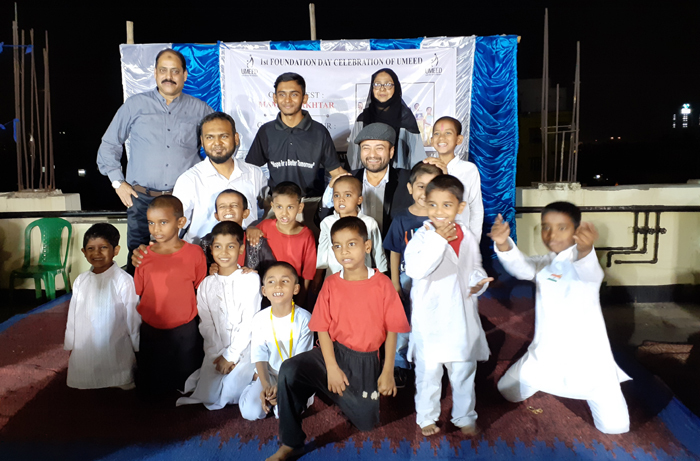 On the occasion, a small function was organized where Umeed kids exhibited their acquired skills – right from singing to showcasing karate skills to presenting a skit before the audience. Umeed’s founder, Wali while addressing the gathering stated that the health of the kids is their top priority as several kids adopted under the aegis of Umeed were malnourished, but are now healthy. Wali, also made it clear that despite most of the kids in Umeed being orphan, the organisation is not an orphanage. “In fact kids here are getting, what my children would be getting when I will become a father,” claimed the young philanthropist. Watch eNewsroom‘s exclusive talk with Wali Rahmani, at his Kolkata office.